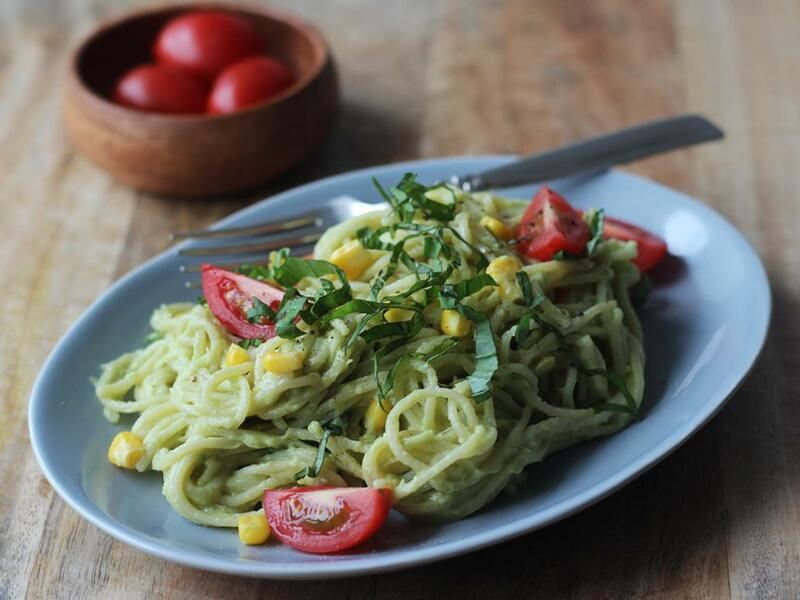 Spaghetti with cherry tomatoes and corn in a tangy garlic and lemon avocado sauce. Spaghetti: Bring a large saucepan of lightly salted water to the boil. Add a few drops of olive oil and the spaghetti and cook for 6-8 minutes. Once cooked, drain and keep warm in a colander over a saucepan of hot water on low heat. Sprinkle with a little olive oil to prevent the spaghetti from sticking together. Avocado sauce: Scrape avocado flesh into a large mixing bowl. 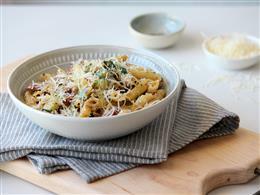 Mash with a potato masher or fork until creamy. Add basil, garlic and lemon juice and mix well. Season with salt and pepper, to taste. Add the olive oil (see quantity above) and mix well. Combine spaghetti, corn kernels and cherry tomatoes with the avocado mixture. Serve immediately. 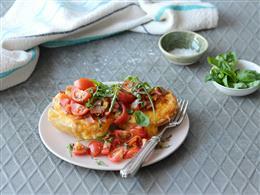 "Quick, and easy this simply dish really hit the spot. Perfect portion size."